I have finally managed to do a fresh installation of Windows 10 v1809. Right after the installation, I have noticed that once my System goes to sleep, it wakes up after just a couple of minutes. I remember having these issues with Windows 10 v1709, but not with v1803. Even though I every time install the same set of software, I have decided to do it once again from the scratch and see the result. Just as I thought, after the fresh installation of Windows 10 v1809, the System, along with the Sleep mode was working properly. Now, it was time to install additional necessary software like iTunes, WinRAR, Microsoft Office, Chrome browser, Mezzmo, Deezer etc. After the installation of the software I am constantly using, the problems with the Sleep mode were back. After the System went into a sleep mode, it was resumed from sleep only after a couple of minutes. I have suspected in my Network devices that were contacting my PC because of the Mezzmo Server. The system has resumed from sleep and that the wake source was unknown. Therefore I decided to disable the “Allow this device to wake the computer” option for the Network card. After this change, my Computer wasn’t waking up a few minutes after it went to sleep. 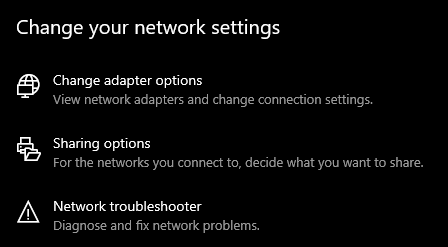 Right-click on the Network icon in System tray and select Open Network & Internet Settings. Right click on the Ethernet connection and click on Properties and then click on the Configure button. 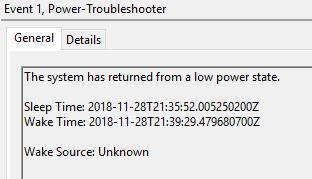 Click on the Power Management tab and clear the Allow this device to wake the computer checkbox.